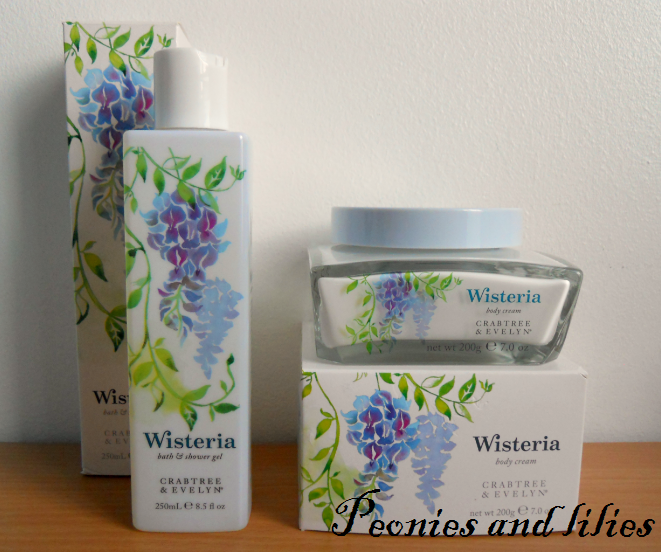 For the last few weeks, I've been testing out 2 products from the new Crabtree & Evelyn Wisteria line. I'll forever associate the word Wisteria with Desperate housewives, but this range is inspired by the blue blossoms of the English Wisteria plant. The flower is then blended with the subtle scent of gardenia, ylang ylang, mandarin, nashi pear and musk. As you can imagine, both products smell really floral and fresh, and everytime I use the body cream, I feel like I'm being transported to a blossoming English garden. The bath & shower gel foams up nicely and is very refreshing, but it's not the most moisturising, so I would recommend following it up with a body lotion. The body cream on the other hand is absolutely lovely. Despite being rich and creamy, it's quick absorbing, not at all greasy, and has a lovely velvety texture when applied to the skin. Both products come beautifully decorated, and the chic glass bottle of the body cream in particular means that it would make for a lovely present. Have you tried anything from this range? What are you favourite Crabtree and Evelyn products? How pretty is this packaging? I want it in my bathroom just to look at! I've never tried any products from this range but I might just change that now you've given them a great review! I love Crabtree & Evelyn products, my favrourite was their Lily line, but this looks amazing too!